Nasal allergies or allergic rhinitis is one of the most common medical conditions in the United States, affecting approximately 30% of the general population or approximately 50 million Americans. Allergic rhinitis is a hyperactivity of the immune system that causes inflammation of the nasal and sinus cavities known colloquially as “hay fever.” In patients with allergic rhinitis, exposure to normal air particulates such as dust, mold, pollen, and animal dander can trigger the release of inflammatory chemicals within the nose and sinuses.This causes symptoms of nasal obstruction, sneezing, itchy eyes, itchy nose, decreased sense of smell, runny nose, postnasal drip, ear pressure, and facial pressure. Allergy to certain pollens may cause only seasonal exacerbations of symptoms as is common in “hay fever.” However, allergy to allergens like mold or dust may lead to chronic symptoms that exist all year long, which is known as perennial allergy. 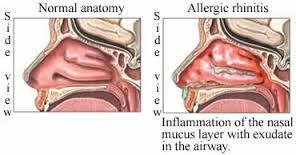 Initial treatment of nasal allergies includes oral antihistamines, nasal steroid sprays, nasal antihistamine sprays, and saline rinses. Failure of initial medical therapy may require allergy testing and allergy shots by an allergist or surgery depending on the clinical circumstances.